Even with blood streaming down his face, Dominic Cruz was able to retain his crown in a split decision against Joseph Benavidez after a tough five rounds of pounding. 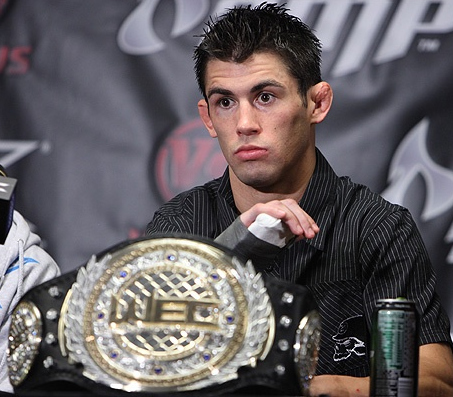 The WEC bantamweight champion danced and dodged for the whole 25-minute event, scoring timely take downs. However, the world-ranked challenger, Benavidez, gave Cruz a brawny test. The first three rounds were highlighted by Cruz’s flying knee and solid counter punches from Benavidez. On the fourth round, the Team Alpha Male rep dealt with a cut on his hairline and appeared to have broken the champ’s nose. Still, Cruz was able to press down the action and scored four of his five take downs on the match. Though his hyper pace slowed, Cruz closed strongly in round five delivering a final slam in the last 15 seconds. Dominic Cruz rose from the battle with two arms raised, smiling, as the final bell sounded.